The most talked about method of training dogs is crate training. More and more dog owners and their pets are learning the benefits of starting puppies on crate training as soon as they arrive in their new home. Crate training is the use of a plastic airline crate or a wire cage to confine a puppy when the family is not home or is unable to supervise the puppy's activities. The crate in effect, becomes the puppy's bed. Other terms used interchangeable with crate training are den and kennel. You may feel that it is cruel to confine a dog to a crate. It would be cruel to just close him in the crate and leave. But if you introduce him to the crate properly, you will find that your puppy will quickly come to prefer it for sleeping and quiet time. Dogs in the wild live in dens. The den provides wild dogs’ protection from predators as well as the elements, and it allows for a feeling of security. That's why you often find dogs curling up under a table, chair, or bed. By giving dogs' a secure place that is all their own, pet owners can take advantage of dogs' natural instincts to help the dog feel safe, thus reducing isolation-induced stress. Crate training, if done properly, is a wonderful training tool with many benefits. Apart from the obvious uses for transporting dogs, a crate can be used for short term confinement--to keep your puppy out of mischief so he does not develop bad habits when you cannot give him your undivided attention. A crate can also be used to develop good habits--to house-train your puppy, to establish a chew-toy habit, and to reduce inappropriate barking and digging. Also, if your dog ever injures himself or becomes ill, the crate will be invaluable during recovery. 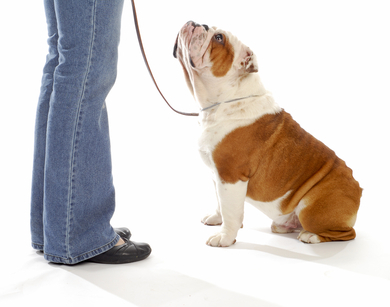 If you move, your dog's adjustment to a new home will be quicker and less stressful if he is crate trained. If you stay in hotels or visit relatives, your dog will be "damage-proof" if he travels with his crate. It is a dog's natural instinct to keep his crate/home clean, so he will "hold it" as long as he can before eliminating in the crate. The maximum time an 8 week old puppy should be in his crate without a break is 2-4 hours. Puppies younger than 8 weeks have to "go" about every 2-3 hours so they should be given a crate-break at those intervals. Except for overnight sleeping, crate confinement approaching 8 hours is strongly discouraged. As the puppy gets older (4-6 months) you can gradually leave him in his crate for longer periods of time, but you should never exceed 6 hours for any dog. If a family member is unable to come home midday to let the puppy out, there are a couple of alternatives. The most desirable would be for a pet-sitter, relative, or neighbor to come by the house and let the puppy out while he is young. If this is not an option, leave the puppy in a confined area with his crate, with the crate door open. This way he can sleep in the crate and come out of his crate to use house breaking pads or newspaper. However, using this method will lengthen the house-breaking process because the puppy will be learning to eliminate in the house. Which Size Crate Should You Use? The ideal situation for housebreaking is to use a size crate that is 2 times the puppy's body length and big enough for the puppy to stand-up, turn around, and lie down in. However, for most people, it is not feasible to purchase new crates as the puppy grows. The best alternative is to buy a crate that will be large enough for your dog when he grows up. As an adult, the dog should be able to lie down comfortable on his side as well as stand, sit, and turn around without difficulty. For housebreaking a puppy, the crate should can be made smaller by using a partition or a divider panel to limit space. If the puppy has too much room, he will eliminate in one area of the crate and sleep in another, thus increasing the time it takes to house-train the puppy. Where Should You Put The Crate? Keep the crate in a lived-in part of the house (dogs are pack animals and prefer to be with their pack / family): a bedroom, kitchen or family room is good--not a garage or unused basement! When the puppy is young it is recommended to have the crate near the door he will be going out to use the bathroom. Having the crate close to the door will help prevent any elimination accidents as the puppy leaves his crate and heads for the door to go out. Set up the crate with the puppy out of the room, so as not to startle him. Use blankets, towels or sheets as bedding. Note: many puppies will chew bedding which can be very dangerous so take time to observe if he is trying to chew his bedding. Do not make the bedding material too absorbent because the puppy needs to be severely inconvenienced if he urinates in his crate. DO NOT use housebreaking pads in the crate because this will attract and encourage the puppy to eliminate in his crate. DO NOT put a water bowl in the crate because it will spill and wet the bedding. DO put 1-2 safe chew toys in the crate with the puppy so he has something to occupy his time. If you are using a wire crate, place a blanket or sheet over the top and sides in order to create a den-like atmosphere. Tuck the ends of the covering under the crate so that the puppy cannot pull them inside to chew on them. When it is time for the puppy's meal, place the bowl just inside of the crate so the puppy has to stick his head into the crate to eat. Between feedings, you can make going into the crate a game by tossing in treats or safe toys. Allow your puppy to come and go at will--do not force your puppy into the crate. When the puppy gets in the crate on his own or because their is a treat inside, this is your cue to start associating a command with the action. You can use statements such as "kennel up" or "go to bed." The most important thing to remember in giving commands is to be brief and consistent. Always leave the crate door open when your puppy is out of the crate so he can get in it when he wants. When you are home, make going in the crate a game. Give your chosen command, such as "go to bed," and throw a treat or toy into the crate. Let your puppy walk in and out of the crate at will. Whenever your puppy goes into the crate on his own, lavish him with praise! Each time the puppy enters his crate for confinement, give him a tasty treat or safe bone. Always use your chosen command when calling your dog to the crate for confinement. DO NOT simply call him to you, as he may become wary of approaching you when called. NEVER USE THE CRATE AS PUNISHMENT! Your dog will pick up "vibes" from you if you put him in the crate when you are angry. The puppy's crate should be his secure place. It should not be associated with punishment, fear or anything negative. If you treat the crate as a wonderful, gentle, lifesaving tool to prevent accidents, destruction, and behavior problems, your puppy will feel positive about the crate too. Every time you let the puppy out of his crate, even if he has only been confined 30 minutes, take him straight outside to his "potty" area and give him your command such as "go potty" or "hurry up." Praise him when he eliminates outside. If the puppy does not eliminate within five minutes and you know it is time for him to do so, put him back in the crate. Wait approximately 10 to 20 minutes and then take him outside again. In the morning, be sure to take the puppy out the minute he starts to fuss. If the puppy eliminates in his crate, clean it up immediately and thoroughly. After cleaning up the urine, wipe the bottom of the crate with a pet odor eliminating product. It is necessary to clean up the odor completely so the puppy does not smell it later and urinate there again. During all unsupervised times, the puppy should be in his crate with the door closed. Normal, healthy puppies generally get into mischief if unattended. The tendency of puppies to "learn" about their surroundings is too strong for them to control--learning means chewing, scratching, and digging. If the puppy is unable to get into trouble, destructive habits will not be formed. As your puppy gets older, you can start leaving him out of the crate unattended for short periods of time. When you first leave him unattended and out of the crate, restrict him to one or two rooms in the house. However, he should continue to have access to his crate whenever he wants. If the puppy gets into mischief in your absence, begin to crate him again whenever he is unsupervised and try again later. Is the bedding material absorbing his mess so he is not severely inconvenienced when he urinates in the crate? Never rule out medical problems when your pet's habits seem to change.